﻿ Cristiano Ronaldo: "We'll be ready for Barcelona!" 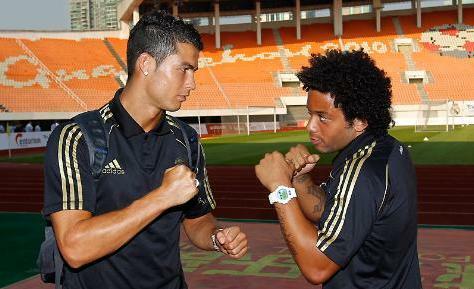 03.08.2011 » Cristiano Ronaldo: "We'll be ready for Barcelona!" 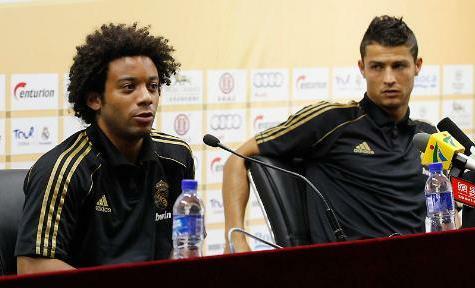 Cristiano Ronaldo and Marcelo were the players chosen to show up in the press conference before the match Real Madrid vs Guangzhou Evergrande, that will be played this Wednesday. 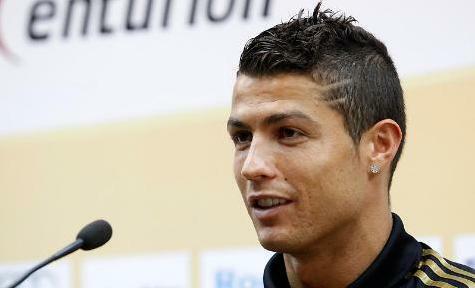 CR7 drove most of the press attention and had a few curious statements. When asked if he would consider moving back to England and returning to Manchester United, Cristiano Ronaldo was enigmatic: "Why not? It may happen, we never know..."
The day before the game Real Madrid against Guangzhou Evergrande, Cristiano Ronaldo attended the press conference in China, to preview the match against the Chinese team, but also to talk a bit about next season. In a crowded room, Ronaldo managed to dodge a few questions traps, like the one regarding the need of a new striker/forward for the team, or if he is worried and concerned about the competition to win the UEFA Best Player in Europe award for 2010-2011. However, there was one question that Cristiano Ronaldo decided not to run away from and that was when a journalist asked CR7 if he plans to return to England and Manchester United someday in the future. Ronaldo replied enigmatically, saying that everything can happen in future. One of the hottest topics of the moment, is the clash between Real Madrid and Barcelona, that will decide the Spanish Supercup winner this summer. The title will be awarded after 2 matches, which will be played in the 14th of August (Santiago Bernabéu) and only 3 days later, in the 17th of August, the second leg will take place in the Camp Nou. Cristiano Ronaldo said that the team is still not thinking about those big games: "We're not worried about that yet. We're focused in the pre-season for now. When the time comes, we'll put our minds into the Spanish Supercup." CR7 showed himself confident that this year, Real Madrid will be able to fight for the big titles and fear no one: "We have the ambition and we're on the right tracks to win something important this season. We have a great team and a great coach. Hopefully, we'll be able to win all the titles that we'll fight for." Cristiano Ronaldo chose to decline comparing this new Real Madrid squad with the one from last year, at least for now: "I still can't tell in what sort of things this Real Madrid team is better than the one from last season, but when the season starts, I may give you my opinion. It's still too early to make any appreciation regarding that." In the other hand, Marcelo doesn't seem to have doubts that this year, Real Madrid will be stronger mostly because of the new signings: "Every year we have to work hard because the competition in Real Madrid is at a very high level and this season it won't be different. Fábio Coentrão is a great player and it's always good to have such a player on our side. We have a great team and we want to start the season in great shape. I believe we're doing things right and we'll be strong this season." Cristiano Ronaldo dodged a few questions and one of them was about the need that Real Madrid might have to sign a new forward/striker, which could imply the return of Adebayor or any other new signing. CR7: "That's a question you should make to the President (Florentino Pérez). Ronaldo gave a similar answer when asked if he was thinking about who has the most chances to win the UEFA Best Player in Europe award, by simply saying: "That's something that doesn't worry me at all." The most unexpected moment of this press conference, took place when Cristiano Ronaldo was asked to comment about the possibility of him coming back to Manchester United and the English Premier League in a near future. Ronaldo: "Why not? That's something that can happen, we never know...". Afterall, it seems that Manchester United fans can still dream about watching Cristiano Ronaldo making a return to the Red Devils and Old Trafford, in the next years. Before ending the press-conference, CR7 also previewed tomorrow's game against Guangzhou Evergrande: "It's another preparation match and we want to win it, because that's always a positive factor. We're focused on reaching the highest physic levels possible for the beginning of the season." Real Madrid has been training in China in the last few days. The first game will be against Guangzhou Evergrande. Cristiano Ronaldo will most likely be in the line-up, but that still needs to be confirmed. You may watch the match Real Madrid vs Guangzhou Evergrande livestreams and Cristiano Ronaldo in action, inside the Live Games Streams section. Countdown clock for the game is shown in the top right corner of this site.